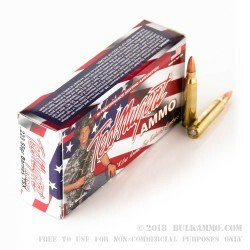 This .223 Remington ammunition is a highly efficient hunting cartridge for medium to small sized game such as coyotes. 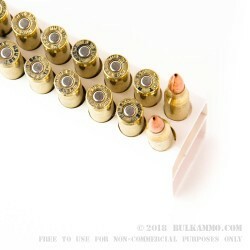 Each cartridge fires a 55 grain Barnes Triple-Shock X bullet that delivers deep penetration, rapid expansion, and quick kills without fragmentation. The Barnes Triple-Shock X bullet is a renowned hunting round that delivers excellent terminal ballistics. 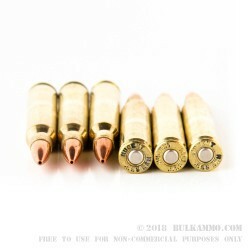 It also features a grooved design that compensates for bullet expansion in the bore and helps cut down on barrel fouling and chamber pressures. 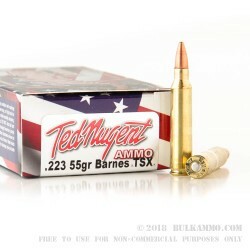 These cartridges are endorsed by rock legend Ted Nugent, an avid outdoorsman and outspoken supporter of hunters' rights. They are loaded by Pierce Munitions of Buffalo, New York using non-corrosive Boxer primers and brass cases.